As much of a Hong Kong phenomenon as smelly taxis is a unique kind of restaurant called Cha Chaan Teng. According to Wikipedia, the name, which literally means “tea restaurant” (cha is tea, chaan teng is restaurant), orginates from the fact that a glass of weak tea is provided to the customer as soon as he is seated. The food – As suggested in Wikipedia, the cha chaan teng serves a wide range of food, from steak to wonton noodles to curry to sandwiches. 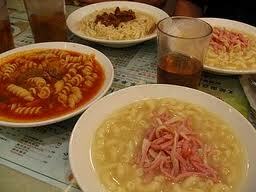 As such, it is very difficult, if not impossible, to pin cha chaan teng food down to a particular type of cuisine. Theoretically, the restaurant offers mainly Chinese and Western food (plus a bit of Japanese and South East Asian food in many cases), but the term “Western” can be quite misleading as what is supposed to be Western food, such as tea with milk, steak and “French” toast, has been completely localised. 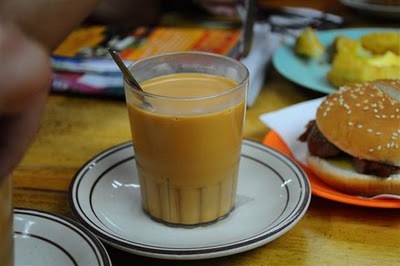 In any case, it never ceases to amaze me that there are easily over a hundred items in the menu of any cha chaan teng. You name it, they have it. I can never understand how they can manage to stock so many kinds of ingredients and keep them from turning stale. That is a wonderful example of Hong Kong versatility and flexibility. Apart from the wide choices, another feature of cha chaan teng food is its thick taste, which is the outcome of the chef's very liberal application of condiments, sodium and MSG. But this ruthless bombardment of the palate is precisely what the Hong Kong glutton hails as delicious. Dishes prepared otherwise would be condemned as bland. A good example is the so-called "pantyhose milk tea", so named because the brown sackcloth bag used to filter the black tea leaves resembles a silk stocking. Despite being compared unfavorably with "proper" English tea by some Westerners, the pantyhose milk tea is held in high regard by Hongkongers, who simply love its "smoothness" - the tea made full-bodied and creamy due to its thickness and the abundance of milk.